I have long admired the writing of award-winning historian William C. Davis, and have several of his books in my collection. His style is crisp and clean, easy to read, and his narratives flow well and are entertaining as well as educational. He has appeared on countless TV programs as an expert, lectured widely, and edited magazines and historical articles, as well as writing more than forty books on a wide range of historical topics, including the American Civil War. 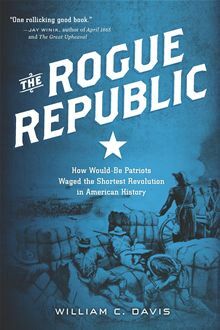 Davis’s latest effort, The Rogue Republic: How Would Be Patriots Waged the Shortest Revolution in American History, is a tightly woven, well crafted book that neatly tells the story of one of America’s early civil wars — the 1810 rebellion of West Florida (which comprised much of today’s Florida, Mississippi, Alabama, and Louisiana). Those areas would secede from the Union in 1860, but fifty years earlier, the forefathers of the Confederates also staged their own rebellion. Now largely forgotten by the general public, William C. Davis has brought life to this rather obscure story, one that pre-staged the Civil War and shaped attitudes and anti-government emotions, and paved the way for self-rule sentiments. Davis’s tale is one of a small band of free spirits who sensed that destiny was on their side, and they could lead their followers to achieve the goal of establishing am independent nation, one devoid of kings or foreign rule, which would self-govern its affairs as a sovereign entity. Most were American settlers, who had relocated to West Florida about the turn of the 19th century and now chafed under Spanish rule. Their aims were not dissimilar to their sons and grandsons who would later clamor for independence from Washington, D.C., and central federalized government. The irony was that Washington also claimed West Florida as part of the United States, assuming that the French had included this land in the 1803 Louisiana Purchase. Spain had not recognized West Florida as part of that transaction. Urged on by President James Madison’s agents and a secret mission by Vice President Aaron Burr, the settlers rebelled in 1810 and waged a brief war, which Davis expertly describes in a “you are there” fashion as the newly established West Florida militia takes on all comers. By early 1811, the United States intervened and resolved the issues, amalgamating the rebellious provinces into Louisiana, which would later be subdivided into what became the modern Deep South states. It is a story seldom told in history books, but paved the way for Manifest Destiny and westward expansion, twin issues that, interrelated with the expansion of slavery, caused considerable strife between the North and the South in later decades. The Rogue Republic is one of Davis’s best works, with an amazing amount of primary research into a now very obscure topic. As a scientist and author myself, I can fully appreciate the hours of research Davis and his assistants must have spent poring through old newspapers, letters, diaries, government files, and other primary documents to gather and analyze the primary source material used in this fine book. The tale is fresh and compelling; the history solid and well written. For ordering information and more details, visit the publisher’s website. You are welcome to cover this story or make use of the material in the press release for your blog. Please let me know if you have any questions.